While yesterday was Mother’s Day, I felt very removed from the occasion. By no means was the first time I haven’t been back at my parents for the day, but regardless, I was on the road in Dayton with softball and just felt disconnected. I guess it just doesn’t feel like a means of celebration when you call your mom from the entry to a Penn Station (side note: goooood) prior to busing back up to Chicago. She was pleased to talk, all the same. Given the running theme of this blog, it’s important that I broach this topic within at least a day of the holiday, regardless of how convoluted or Hallmark-driven it may be. 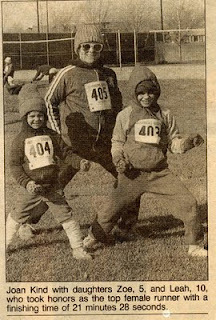 Plain and simple: I run because of my mom. I dislike how age robs us of rich memory, as the visions of going on a run with her in my youth are now very faint but still there. I recall finishing up our outings upon reaching the edge of the driveway, her in a sweatband (crap—or was that me?) by our house, and walking a few houses down and back to cool off. I must have been no older than four/five at the time. I barely can remember this, but I do remember rounding the back of the golf course at McCollum (where the Trot was held) and things not going well. Maybe it’s because my hat was so big. I mean really. That hat is massive. 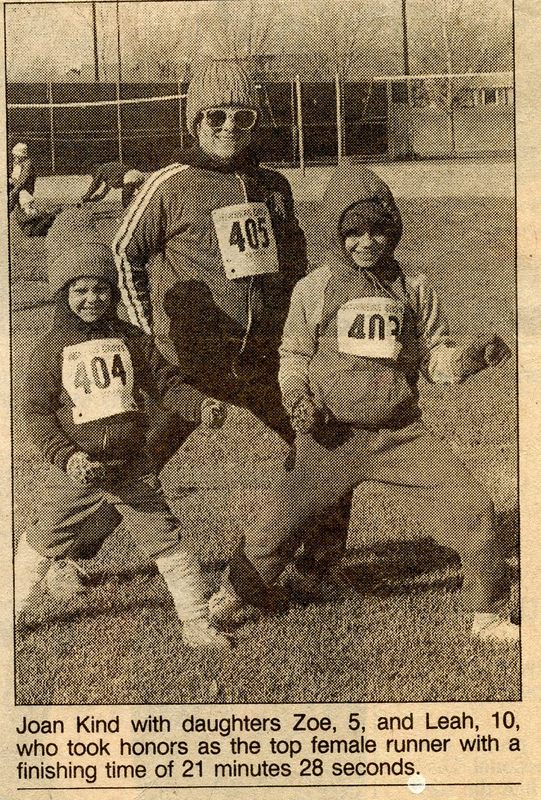 Its part of the familial lore, the Turkey Trot tale of me and her finishing that race while my older sister presumably cheated (so its presumed as she wasn’t THAT fast at ten) her way to victory. But this isn’t about her, it’s about me, and I apparently didn’t want to continue on our running journey. Mom offered me everything and anything so as to bribe me into completing the 5k; a trip to Europe, wealth, jewels, riches (sadly, all I can specifically recall is a trip to Burger King. Wonder if I can cash that in now…). There would be other races and travels along the way, especially a strong urging from her to be part of the cross country and track teams in both middle school and high school. There were times I wanted to stop and quit throughout time, but there was always some bad ultimatum if I actually went through with it. So I continued on. Throughout middle school as a tiny baby-fat filled tween/teen, an ambivalent freshman who grew into a varsity/conference/regional/all state stud at the conclusion of my high school career. The funny thing is that I can’t recall a single race she may have missed throughout my high school career. She traveled down to state, across the suburbs; hell, she even got a ticket for driving over 100 mph trying to get down to Peoria for one of the first meets of the season (she missed my race, caught my younger sisters). She was there with a very distinct pitch in her cheering me on, either on the sidelines or working the meet (a totally under appreciated facet of the dedicated high school parent: track meets are generally COLD). Though, going through my treasures of the past—there was one meet she missed. First high school cross country race, the Big Cat Invitational my freshman year. An awesome course at Phillips Park in Aurora (though I think they may have changed the park/layout), it was rolling and tree-encrusted (and there was a zoo at said park). I ran regional’s there my junior year in 2000 with a freshly buzzed head—but that’s another story. If memory serves, she drove out to Iowa City, where my elder sibling was attending school, for a concert that weekend. I am so sorry that I will miss your entrance to the big leagues. 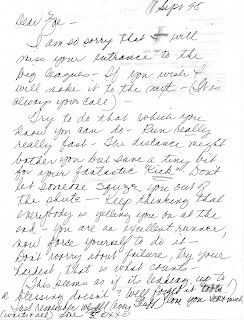 If you wish I will make it to the next (it is always your call). Try to do that which you know you can do – Run really, really fast. 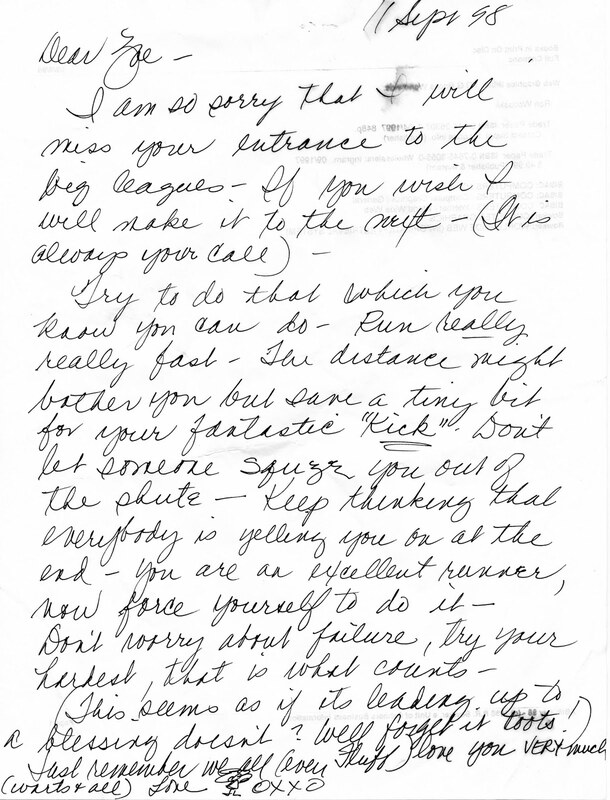 The distance might bother you but save a tiny bit for your fantastic “kick”. Don’t let someone squeeze you out of the chute. Keep thinking that everybody is yelling you on at the end – you are an excellent runner, now force yourself to do it. My mom would always include notes of some sort or another with our lunches, on index cards. But this was one of the few running-related notes left for me as I gathered my things before heading to the bus pre-meet on a Saturday morning. 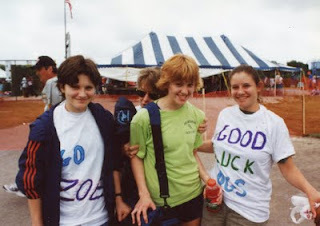 My own cheering section at track state, 2001. Elder sister Kind (right) said my hair back in those days looked like a Golden Lion Tamarin Monkey. Though hobbled by life-long knee problems and progressive arthritis, she still remains connected to the notion of running, always asking me how things are going, telling me I should run a marathon. I’m hoping to coax her out to the big city in a few weeks for the Solder Field 10 Miler, which my younger sister will also be present in (at least she better be—I got her an entry as an Xmas gift). I think her sitting inside the stadium for the finish will be very cool. I can already her hear cheering.